I was talking to my two great Nephews the other day, one age 6 and one age 4, on the meaning of Lent. I was quite surprised to find that the older child had given up technology; he told me he was going to stop using any type of computer game. How time has moved on since we were children, there were no phones or computer games then. We played out with friends and it didn’t matter what the weather was like we just used to wrap up and carry on. I couldn’t imagine any of us giving up our play time. So I thought how amazing this is for a 6 year old boy to give up something that most children spend their time doing. So I asked my Nephew what he was going to do with all this time he would have spare, there was a look of confusion before the younger boy said ‘I’m giving up chocolate’. A week later when I caught up with my Nephew’s again I wasn’t too surprised to see computer games in their hands. Hey I asked ‘I thought you were giving this up for Lent’. The older boy said he had changed his mind and was now giving up chocolate instead. I asked what are you going to do with all the chocolate you are not eating, both shouted at once ‘giving it to the poor’. I would imagine most people who give up something for Lent often choose chocolate. I am no different as for many years this was the thing I chose to abstain from. I wonder how many people actually make it through this period without succumbing to temptation. From well before Ash Wednesday, which is the start of Lent, there has been temptation everywhere. The shops are full of chocolate and Easter eggs which usually are at the end of nearly every aisle. Even our Church has held a chocolate bingo evening and raffle with the main prize being a chocolate hamper. By the time this messenger reaches you we will be most of the way through Lent, and hopefully the craving you had for chocolate or whatever else you have given up is passing. The true meaning of Lent is so much more than giving up something though, it is about repenting, reflecting and generally giving your time to do good. Why not look at the environment instead and think about not using plastic for this period. Or try using your car less or sharing your journey with someone else. There is so much more we can do for this Kingdom we live in. Or spend some time within your community just helping others or talking to someone who is lonely. Giving time and thinking about the world we live in is so much more than just giving up something. God created the world for us to cherish and protect. I very rarely give up anything for Lent anymore, but I spend my time repenting and reflecting and trying to do good for others. This maybe just spending time with someone in need, or praying for them, or visiting the sick or helping with a Lent course or community group. Easter is fast approaching, and we shall be celebrating the resurrection or our Lord Jesus Christ. Chocolate will be in abundance, and you can eat as much as you like but remember Easter Eggs represent the empty tomb of our Lord Jesus Christ. The tomb is empty because our saviour rose from the dead. So let us all celebrate this Easter period together and join in worship throughout Lent, Holy Week and Easter. Bring friends and family to one of our services and help grow this faith and this Church. Jesus spent forty days and nights in the desert without anything but his thoughts and being tempted by the devil. Do not let our busy lives, our selfishness, our lack of faith forget that Jesus Christ died and rose so we can live to love and serve one another. Doesn’t time fly when you are having fun? It’s usually the case that stuff we have been looking forward to such as a day off or a holiday can take a long time to get here and then when it does eventually arrive it seems to be gone in a flash. For me the season of Christmas is a bit like that. I have said before that it is my favourite of all of the seasons of the year and this last one, like those before it, seemed to take forever to get here and then just a couple of weeks ago at Candlemass there it was gone again for another year. Difficult though isn’t it? Living in the present always will to a large extent be conditioned by what has gone before and living in the here and now can indeed affect the future; for instance unless we as a race begin to heed the warning signs and begin to take seriously our responsibility to look after God’s creation; which includes all living things, all that we see around us, then the world will not be fit for purpose for future generations, it really is as stark as that. The scriptures are full of messages about human beings having dominion over God’s creation and if we ignore this responsibility then we do so foolishly and dangerously. We cannot help but notice that environmentalists are being quite vocal about the damage we humans are doing to the planet we inhabit and quite rightly so. Programs such as The Blue Planet have drawn our attention to both the beauty of creation and the reckless way that humanity abuses it. But we don’t just need to listen to David Attenborough showing us pictures of far flung exotic places: I was sat waiting to enter a roundabout to join a motorway just the other day and felt sickened at the refuse that had clearly been thrown out of car windows and left to pollute the environment… our environment! Collectively we humans can do much to challenge and change the mindset of those who think it ok to abuse this world that we inhabit and we must do so to safeguard the integrity of God’s creation for the benefit of us, for future generations and for the life of this amazing planet that we call home. Time does indeed pass very quickly: we have just said goodbye to Christmas once again and are looking Lent in the eyes: Please don’t forget our Ash Wednesday Service 7:30pm on 6th March by the way, and of Course Lent is about taking stuff on rather than giving stuff up. Can I make a suggestion for Lent please? Can I encourage you to think about what you can do to help the environment: It needn’t be about big grand gestures or self-sacrifice but rather about how we dispose of things, how we re-cycle. How we challenge over packaging, how we educate those who don’t give any thought to the harm they are doing when dropping their litter. God gave us dominion over His creation; we need to take that seriously for the sake of the future of our planet: Let’s be happy stewards of the planet we inhabit! 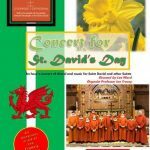 The Liverpool Anglican Cathedral Choir will sing a concert of music for St David’s Day and Ian Tracey will also play organ music related to St David. There is no charge for the concert, but a donation is welcome in aid of choir funds. The concert will last approximately one hour. Amid the hustle and bustle of Christmas, the tinsel, the sparkle and the mince pies, our vicar, Peter, asked me to write a piece for this month’s Messenger. Of course I said yes and promised myself I would work on it just into the New Year hence me sitting on a damp and dark January evening struggling to find an interesting enough topic to write about. One huge word springs to mind… BREXIT but to me that word conjures up indecision, division and complete disregard for togetherness. I thought about all the reasons we have to celebrate this year, all the special days we will share as a community in our church or as families in our own homes. Being a fairly newly married man the next important day on my calendar is Valentine’s Day. The feast day of St Valentine is a celebration of love and affection. St Valentine was born in the third century AD and he was executed on 14 February by Emperor Claudius II in Rome. In pagan times February was the time of year for fertility rituals and the Roman festival of spring and pairing off of women to men. According to legend, St Valentine sent to his jailer’s daughter who he had befriended, and by some accounts healed from blindness, a letter signed “from your Valentine”. In Roman times only single men would be called to war so St Valentine, who was a priest, secretly married couples to spare the husbands from war. It is for this reason that his feast day is associated with love. However, many years later it was the poet Chaucer who linked St Valentine to romantic love. Since the 1500’s formal messages of love have been sent and by the late 1700’s commercially printed cards have been used. In the Philippines the 14th of February is the most common wedding anniversary with mass weddings of hundreds of couples not uncommon on that date. The Welsh have their own version of St Valentine called St Dwynwen, and her feast day is celebrated on 25th January. Whilst St Valentine’s day is a good opportunity to remind those close to us of how much we care, we need to remember that as Christians and followers of Jesus that every day is an opportunity to show love to all whose lives we touch. We live in a society very quick to marginalise and discriminate. We have families within our community dependent on foodbanks. In the news this week we have heard of schools opening during Christmas holidays to ensure that children were fed – this is love. We heard of the Foodbank in Oldham being ransacked – people from across the UK and other parts of the world have rallied to re-fill the shelves making sure families don’t go without – this is love. God gave his only son into this world, sacrificing him so that we would be free – this is love. In the gospel of John 4:19 we are told “We love because He first loved us”. May the love of our Lord always be with us and as we draw close to February, the month associated with love, may our hearts be filled with the desire to share God’s love so freely given to us all. Every blessing, Adrian and family. I have always loved the autumn and just this morning as I was walking along Queens drive enjoying the crisp November sunshine I was reminded of when I was a kid walking along Elm Vale close to the family home kicking up leaves as I went. I cannot tell you how tempted I was to do the same this morning. Perhaps I should have done to give the frantic drivers something to chuckle about instead of taking life so seriously, but I didn’t! It was as I walked along I thought how quickly life passes. I thought of the beautiful summer we enjoyed this year, seems like it was just last week rather than months ago. Then, not at all depressingly, I thought about the funeral we have in church this afternoon then the visit to a bereaved family that I have arranged after that. Not gloomy thoughts, it’s just part of life! When I got back to the vicarage I made a cup of coffee and logged onto Facebook, someone had shared an ‘inspirational’ article from some guy talking about visiting his aunt as a child. During the visit he had commented on the beautiful glass & china that his aunt kept in a glass display case which his aunt told him only came out for special occasions. A month later his aunt died very suddenly and after her funeral service his parents & other aunts and uncles sat in that same room drinking tea out of the fine china and whiskey out of the fine glasses… life is indeed short! Now I will pause here and apologise if I am depressing you, that is not my intention at all, just the opposite in fact. We are of course entering the most beautiful Season of Advent and Christmas, I don’t know how many you have enjoyed so far in your life but having reached a significant birthday this year I could tell you exactly how many Christmases I have been here, but I won’t! The poor abode was a stable in Bethlehem, the occupants were animals, Mary, Joseph and the new baby Jesus. In that one statement poor old Marley is voicing his regret that he wasn’t kinder to his fellow humans during this life and that he didn’t focus on the wonder, joy and real life that God gives to the world in the form of Jesus Christ. Marley had left this busy earthly life seven years earlier never having given a thought to either. He had been far too busy worrying about his own business to give anything else a thought, and here he was thinking about it, too late! Too late for Marley but not for Scrooge. Marley’s tale helped Scrooge turn his life around, and he did, and he reaped the benefit whilst he was still here. We might ask why on earth Marley bothered to come back to chat with Scrooge. We might also ask why God bothered to send His own son to live among ordinary human beings. The answer in both cases is quite simple, it was to save human lives. God wanted to know what it was like to be human so He came among us to experience our joy & our sorrow, our highs, lows and the bits in between. He came to understand us better. He came to save our life just as Marley did with Scrooge. Jesus speaks a lot about joy in the Bible. In the gospel according to John (17) He says this: “I am coming to you, and these things I speak in the world, that they (meaning us) may have my joy fulfilled in themselves”. ‘At this time of the rolling year’ we would do well to remember the true Christmas Story which is about having and living life to the full. “Life is for living” my dear mum used to say and she was quite right: As we approach the festive season, which incidentally lasts until February the second, it may be good for us to take a closer look at those around us and try to love them. Yes even the strangers and to look up and think about that lone star which led the Magi to Jesus. There is joy to be found in this life and it is right here among us, let’s take this time to connect to that joy hey? A very Happy & Holy Christmas and a love & joy filled 2019.